Here's David Weinberger talking about Everything is Miscellaneous (the book I reviewed here and many others did here). The hour-long talk stands on its own and covers much of the book, though I don't recommend watching it if you're planning to read the book. I went to Linux World Expo today and played with one of these upcoming One-Laptop-Per-Child project's XO-1 laptops at the Creative Commons booth. 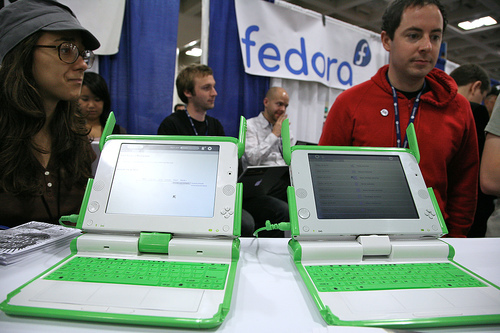 Photo by Scott Beale / Laughing Squid (cc) While OLPC is a noble effort, I think it still feels like another example of trying to solve a problem with technology where technology is not the bottleneck. For example, I was bummed that they took away the hand-crank power-supply a while back because I think this severely limits who'll be able to eventually use these. The UI and networking stuff is pretty novel, but my overall impression is that it's too gadgety. I felt pretty lost in all just the buttons on the keyboard, but then again I only used it for 20 minutes and this wasn't made for me. With that said, I'm not holding my breath, but it could be a great thing if this takes off. I say "could" because technology by itself just isn't enough ((A point the OLPC project acknowledges in their vision.)). This is a point I keep coming back to again and again.